(June 16, 2015) – Entering the twilight years of their lives, three best friends one day decided to pool their resources and live out their remaining years together. But where would they find a home -- something that would support the needs of three senior citizens? 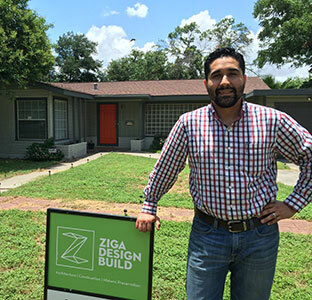 UTSA alumnus Felix Ziga ’12 and his local design firm Ziga Design, Build LLC took on the challenge. And the result, “Tierra de Dios (God’s Land),” looks like it might start a new trend. Ziga and his team are designing every aspect of the home to meet their clients’ unique wants and needs. The 5.6-acre site includes a main house and guesthouse. It features shared patios, community gardens and other aspects meant to emphasize supportive and communal living. As the design progresses, Ziga and his team hope to integrate sustainable practices such as rainwater harvesting, solar energy, among other conservation features. The clients have also expressed a desire to have part of their property serve as a community outreach center so they can teach underprivileged youth about wildlife preservation and local flora and fauna. Tierra De Dios (God’s Land) is Ziga Design Build LLC’s first major project since the UTSA alum began his firm a few months ago. It recently took home the Universal Space prize in the Future of Architecture Residential Design Contest and Showcase, for a conceptual residence design that would facilitate communal living in the Texas Hill Country. The American Institute of Architects (AIA) and Houzz, a web platform for home remodeling, hosted the contest. For more information about Ziga Design Build, LLC, visit www.zigadesignbuild.com. To view early design concepts for Tierra De Dios (God’s Land), visit its page on Houzz.com.